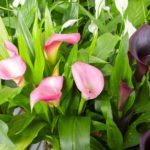 my calla lilies are about 3ft. tall. The wind has blown half way over and they have thinned out. What do I do? Do I cut all the way back? Wait until the calla leaves have turned yellow to cut them down. Meanwhile, you can support the plants with a couple sticks and twine or a traditional plant support, available at box stores and garden centers.